Search Results for "friendship women"
Two beautiful girls lying in bed close up, looking up and kicking each other with legs. Girlfriends dressed in nighties and black robes rest at home. Concept of women friendship. Back view of three fit woman walking in the city center, then turning to camera and laughing happily and playful. Casual wear. Women in the city. Real friendship, trust. Windy weather. Two beautiful young female friends smiling showing thumbs up while eating popcorn at the movie theatre. Happy women enjoying movie premiere at the cinema. Friendship, entertainment concept. 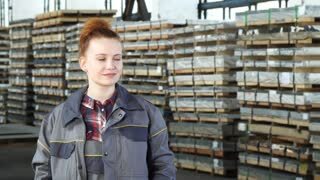 Young beautiful female factory technicians sitting in a forklift embracing laughing to the camera. Cheerful women warehouse workers hugging resting after work. Industry, occupation, friendship. Cropped shot of two female friends enjoying watching comedy movie at the cinema. Happy women eating popcorn, laughing cheerfully at the movie theatre. Friendship, food concept. 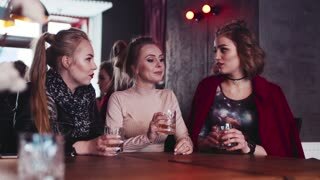 Shot of three female friends chatting after working out together. Fitness women using smart phone at the gym, relaxing after exercising. Friendship, communication, technology. Three young stylish women walking, talking, laughing in the city-center. Fashionable look, amazing red coat. True friendship. Leisure time. Urban architecture. Sunny weather. Three gorgeous women party hard with alcohol cocktails. Having fun with a true friends, drinking toast to friendship. Young and beautiful, happy memories. Enjoy life. Close up view of gorgeous women wandering in the city center and communicating, smiling, laughing. Stylish outlook. Windy weather. Busy center. True friendship. Embracing each other. Attractive young woman engineer receiving protective hardhat before starting work from her female colleague. Factory technicians preparing for working day. Friendship, helpful coworkers concept. Mature beautiful woman laughing while her younger friend whispering secrets to her ear. Cheerful female friends gossiping on green chromakey background. Friendship, lifestyle concept. Cropped shot of two young beautiful women eating popcorn while watching a movie together at the cinema. Attractive female friends eating popcorn at the movie theatre. Friendship concept. Beautiful young athletic women working out together at the gym studio. Sportswoman doing sit ups while her friend is helping her. Fitness, toning, muscles, friendship concept. Ladies in cafe taking selfie. Senior women and coffee cups. Friendship is priceless. 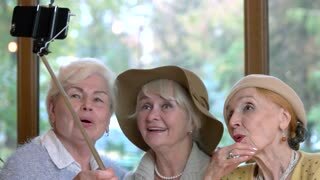 Three senior ladies taking selfie. Women smiling for a photo. Save friendship after many years. Senior women touching hands. Two coffee cups on table. Friendship built on understanding.